The creators changed the style of showing the world. They just don't do it anymore. They don't wander around the world, meet new unimportant people every time and doing nice little things. Instead they focus solely on one big story plot, with several light hearted moments and a love triangle set in a single place. The story this time is much more darker in theme and art style. 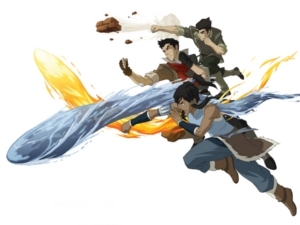 Its focuses on racism, intolerance and Korra overcoming her complexes and fears. There are far more intrigues and betrayals going on that make the story more complex and varied. On the other hand, we get these hilariously jokes and moments of jealously, which make all of the characters more likeable. There isn't a single one i hated or didn't find at least interesting. There are even a few references to the old cast, which was cool and nostalgic. We see some descendants like Zukos child or flashbacks with the adult versions of the old team. The world even though it is not much shown or explained looks unique and fresh. A combination of asian culture and steampunk influenced by magic bender powers. The art style itself is also gorgeous in HD ready - 720p with its fluent animation movements. Fighting scenes were nicely choreographed and exciting. A lot of Animes should take this series as a example. In Part 2 of my post i will focus on the ending and what i disliked about it, but now i will stay at the positive side of this incredible masterpiece. What did you like about this story and how well did it in comparison to the original series?